In another world, I am the “Consult-Ant” on the Leaping from the Box website. I answer questions about ants and ant farms. Recently, some fourth graders in Georgia had a lot of questions about the ant farm in their classroom. Here are their questions (some of which are quite entertaining) and my answers (which are not as entertaining :-)). 1. Why do they (the ants) make tunnels (in the ant farm)? The ants make tunnels because they live underground and need a way to get from place to place. Ants use their tunnels to store food, as a place to raise young ants and they even have special areas they use as dumps or trash bins. They live underground for many reasons. One is temperature. It is cooler underground in the summer and warmer in the winter. Another is that it is safer because enemies like birds can’t get in and eat their babies. 2. Why do they eat their dead friends? You have probably seen what looks like the ants are eating their dead friends because an ant farm isn’t really at all like how ants live in nature. In nature, ants take their dead outside their nest and pile them in special areas. Sometimes they cut up the bodies to make them easier to carry outside. Because they can’t take the bodies outside in an ant farm, they probably just cut them up. That might have looked like they were eating them, but they most likely were trying to get rid of the bodies somehow. Sometimes ants without a queen act strangely too. I’ll write more about that below. 3. Why do they die fast? What an important question. Normally, ant colonies have a special ant called a queen. 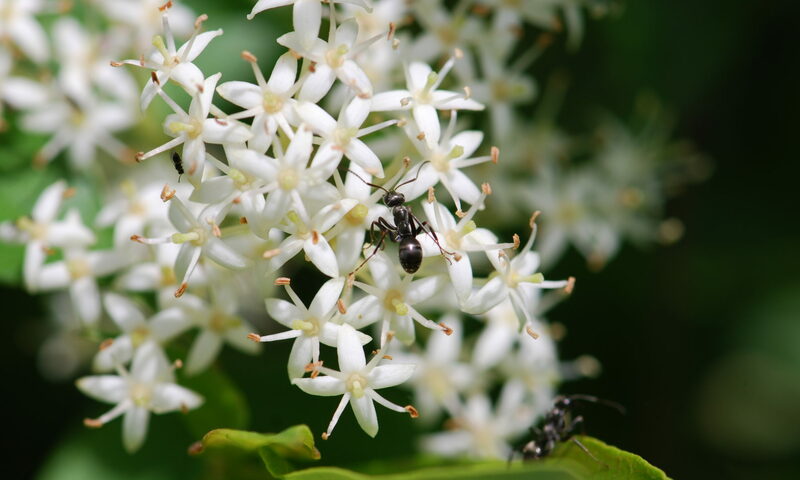 She is the only ant to lay eggs, and she makes special substances that keep the worker ants healthy and happy. In an ant farm, there are only worker ants. The companies that sell ant farms are not allowed to send queens through the mail. Without the queen and their colony, the worker ants don’t get the special substances and they die much more quickly than they probably would have if they stayed with their colony. By the way, queens can live a long time. Some queens live 10, even 20 years. 5. Why do they communicate with their antennas? Ants use their antennas partially like we use our noses, to smell things (they also use them for touch). When an ant meets another ant, it will touch it with its antennas to pick up any scents. The ant can tell if an ant is a member of its own colony from its smell. If the ant is a member of its colony, it will let it pass. If it is an ant from a different colony, it may try to chase it away or fight with it. Sometimes when two ants from the same colony meet, one ant will smell that the other has eaten something good. It will ask that ant to share by tapping with its antenna. The ants will pass food to each other. The long name for this is “trophallaxis.” It kind of looks like the ants are kissing. Ants use their antennas for a lot of other things, like looking for food. When they find food, they sometimes lay a trail of scents, like perfume, back to their nest. Once they get there other ants can follow the trail with their antennas. In fact, if you look closely at an ant, you will see its antennas are not like other insects because they have a bend, like an elbow. That bend lets the ant hold its antennas down toward the ground where it can follow scents laid down by its sisters. Ants do a lot of different things with their antennas. You might want to get a book out of the library to find out more. 6. Why do ants eat their own dead? You classmate had a similar question. I told her that in nature ants take their dead out of the nest and pile them. Because they can’t do that in an ant farm, they were trying to cut them up and get rid of the bodies. Ants are very clean. They don’t like to leave trash lying around. It makes sense, because the other ants could have died of a disease, or get moldy if they are just left around. That could spread disease to the living workers ants. The ants are just trying to clean up the dead bodies. 7. Why do they dig tunnels? 8. Is there such a thing as a flying ant? During certain times of the year the queen lays eggs that become new queens, which are queens with wings. Some of the eggs also become winged males. The two forms fly out together on a flight. After the flight, the male dies and the queens pull off their wings and start digging a tunnel. It is cool to watch a queen ant take off her wings. They rub their back legs against them and actually pull the wings off. 9. Is there a king ant? There are male ants, but they don’t live very long. Both honey bees and ants have queens, but no kings. Termites do have males who hang out with the queen and are called kings. 10. When they bite do they have poison? Okay, actually ants defend themselves in a lot of different ways. Some ants bite with their jaws, but they don’t have poison in their jaws. Some ants sting, with a stinger that’s at the other end of their body. Those stingers do have poisons, called venom. And some ants can spray acids at their enemies, although that works a lot better for little enemies than big ones like us. Fire ants are known to actually bite first, draw up a bit of skin with their jaws, and then put their stinger into the pulled up bit. That might be why people think they are biting. They are stinging too. 11. Why do they bite, do they just want your blood? Ants are biting, stinging or spraying acids because you are really, really big to them and they think you are going to hurt them. They are just trying to keep you from crushing or killing them or destroying their home. Now mosquitoes, they do want your blood. 12. Why do they like eating the dead ants? I see several of your classmates all have similar questions, so you have been talking and thinking about this, I can tell. It’s good that you have been wondering. It turns out that the ants in the ant farm are doing something they normally wouldn’t do if they were outside. In a regular nest when an ant dies, another ant picks it up and takes it outside. They like to keep their nests clean. If that dead ant is heavy, they might cut it up to make it easier to carry before they take it out. In an ant farm they can’t take the dead workers away, so they just cut them up as small as they can. It might look like they are eating them, but they aren’t. 13. Why do they go crazy when people blow at them? That’s a very good observation. When the ants are underground, they are protected from wind. So if they feel an intense burst of air, it’s probably either the breath of something really close that is coming to eat them, or the air being pushed by something jumping at them. In any case it would be a good idea to get ready to run and/or to defend themselves. 14. How long do they live? These are important questions that scientists have spent a great deal of time studying. How long an ant lives depends on what kind of ant and also whether you have a worker or a queen. Most worker ants live about one year, but some have lived over three years. Most queens live over ten years. The oldest queen recorded so far was a harvester ant queen who lived to be 30 years old! 15. How big can they grow? Again that depends on the kind, or species of ants. There are types of ants that live in the tropics that have workers one inch long. The biggest ants are the queen driver ants from Africa. They are over 5 cm long. Ask your teacher for a metric ruler to see how long that is. 16. Why do they live so little time? Do you mean the ants that were in your ant farm didn’t live very long? I’m sorry to hear that. There are a few reasons ants in ant farms don’t last long. One is that you don’t know how old they were to begin with. The youngest ants stay deep within the nest, so when the people from the ant farm company come along and grab ants, they often grab the very oldest ants. If worker ants live a year, and yours were already nine months old, they only had a short time to live anyway. The second reason is that ants don’t thrive as well without their queen. The queen makes special substances that keep the other ants in the colony happy and healthy. Without the queen, ants just don’t do so well. By the way, the companies can’t send a queen through the mail by law. They can only sell workers. Thanks for all your questions. Looks like you’ve really been thinking a lot about ants. That’s what science is all about, thinking up questions. I am glad you find ants so interesting, because I do too! Edit: If you are interested in books about ants for children, check this recent post. If I add eggs from another colony and queen from a different colony, they will not fight right? Or if I just get the queen and eggs from the same colony, then that could work right? Tell me which one is best plz! Thnx! As long as the ants were sisters, they would stick together. SO when we crush an ant, why do the other ants around it go bonkers? Do they know we are crushing them or they think an enemy just mysteriously stepped on or sat on their sisters? Generally when you crush an ant, it released a smell called an alarm pheromone. When the ants detect that smell, they go crazy. They probably have no idea what caused the smell, just to react to it. will it hurt the male/queen ant if I hold it by the wings? Yes, there are species of ant where the queen digs or makes a nest all by herself. Carpenter ant queens are a good example. The wings of Hymenoptera (bees, wasps, and ants) are thin and flexible. That said, the queen’s wings are meant to be torn off after mating. If you tear the wings of a queen before her mating flight, she won’t be able to lay eggs to become worker ants. does what a ant eats effect the shape of its tunnels. What a good question. It turns out that what kind of food ants eat can make a difference. For example, harvester ants build special tunnels to store seeds. Leafcutter ants have special tunnels/chambers for growing their fungus gardens. Honey pot ants have special tunnels for the replete (storage) ants. Of course, the size of the ants and their environment effect the shape of the tunnels, too. How does the queen ant have wings but doesn’t use them. Why? The queen ants do use their wings, but only once. Queens (of species that have wings) fly from their home nest to go on a mating flight and then start a new nest. Previous PostPrevious Ant Sting or Bite?